For those who have an aversion to ladders, heights, or the gloppy sludge that accumulates in the gutters, there is always the option to hire someone else to do it. Either way, it is a task that has to be done to maintain the integrity of your home – inside and out. How Important Are Your Gutters for Your Home? Your gutters are absolutely critical for preventing water damage. Gutters keep rain water and melting snow from reaching your home. They direct water away from the foundation. An inch of rainfall results in approximately ½ gallon of water traveling through your gutter system per square foot of roof. This may not sound like much at first, but for a 2,000-square-foot roof, that means about 1,000 gallons of water surges through your gutters and away from your home with every inch of rain. If those gutters aren’t working properly, that’s 1,000 gallons of water looking for the path of least resistance to the lowest point…which is most likely your basement! Gutters should be cleaned yearly, preferably twice a year, to avoid debris from accumulating and backing up your roof’s drainage system. If you live in an area dense with trees, you may even need to clean them out three or four times a year. Clogged gutters lead to ice dams in the winter weather. Water that isn’t properly directed away from your home can also accumulate around your house and cause a frost-heave in colder weather. The freezing and thawing cycle is normal, but if excess water is pooling around your foundation, it can lead to cracks in your foundation which can impact the integrity of your home and result in costly repairs. In warmer weather, clogged gutters lead to overflow which can cause roof and wall damage, leaking basement windows, mold problems and flooded basements. These handy scoops are a useful tool for getting everything out of gutter quickly. Gutter scoops make gutter cleaning simple and generally sold for between $5-10, an inexpensive and very budget-friendly tool to get you out there cleaning those gutters – no excuses! For not too much more, around $20, you can get a telescoping gutter brush which can reduce or eliminate the need for a ladder. Another option for those that prefer using power tools and equipment are blower attachments. These attach to leaf-blower systems and can help you blast your gutters clean. Several types of power washer attachments are also available. 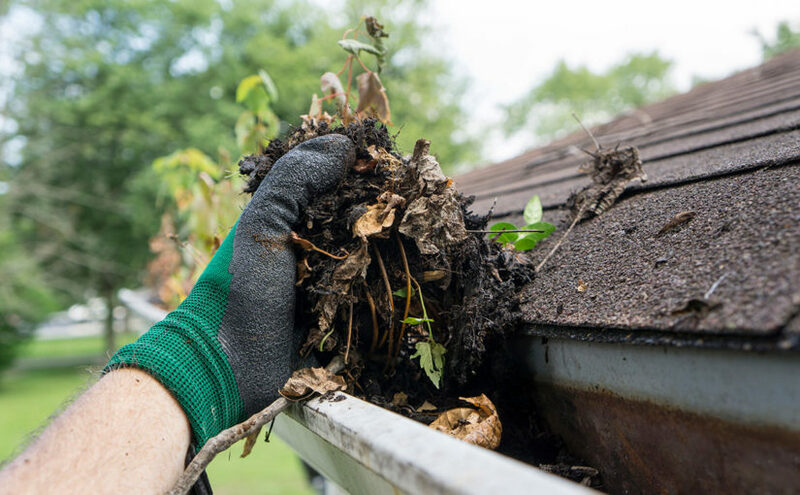 Power out the gunk in your gutters and, with most attachments selling for $100 or less, even these options won’t put too big a dent in your wallet. So you want to clean those gutters once and for all? One way to avoid the “joy” of cleaning your gutters is to have a gutter guard system installed. There are many types of guards. They all have their own pros and cons but will ultimately keep your gutters from getting clogged in the first place. This can be a DIY project for those who would rather save some money and do the work themselves. Several types of gutter guards are available from home improvement stores. There are also professional installers who can install a gutter guard system if you aren’t the DIY type. Downspouts are just as important as gutters. If they don’t drain far enough away from your home, they defeat the purpose of gutters. There isn’t a hard and fast rule of how long downspouts should be; they simply need to divert water away from the foundation. The grading around your foundation and the type of soil all play into the correct downspout equation for your home. If downspouts are releasing water too close to your house, extensions can help direct the flow further away. Easy to install, downspout extensions are worth every penny to protect your home’s foundation. Like gutter guards, downspout guards prevent clogged downspouts. Downspouts are harder to clear than gutters, so prevention is helpful. Downspout guards are simple to install and quite reasonably priced. Most are less than $10; some are even less than $5. If gutters become broken, cracked or develop open leaks, they offer far less defense against moisture damage. In addition to cleaning, they need to be examined for weather damage or deterioration. Address any issues right away. Repairing gutters now is a small price to pay and will help you avoid costly home repairs in the future.